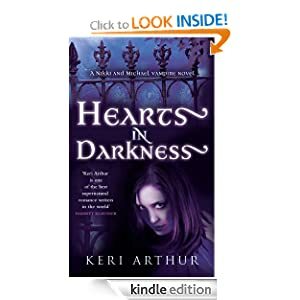 Hearts in Darkness Nikki and Michael Book 2. Keri Arthur. Keri Arthur was new to me until I recently had the first Nikki and Michael book Dancing with the Devil for review. I loved it and so was keen to get book two. It doesn’t disappoint, once again Keri’s writing is clear and concise, and filled with action packed moments, drama, and yet the thread of Nikki and Michaels romance runs solidly through it. Michael left her without even saying goodbye at the end of the last book. Forced by Nikki to drink her blood when he was dying and didn’t realise what he was doing, he has to fight again the demon that makes him crave human blood and is scared he’ll accidentally give in and kill Nikki if he stays. She’s hurt but understands in a way, though doesn’t agree and when they’re thrown together in a new adventure she warns him she’s not taking No for an answer. He says he understands but will hold out, but Nikki – not only is she a tough investigator but determined not to give up on their love. Again a brilliant story with them fighting the unknown with unknown powers yet. I was gripped – I love this sort of story and the romance threading it adds to the attraction for me. Not just will they get out of this tight corner, but will Nikki win out on her ploy to reel Michael in…I’m rooting for her – they need and are perfect for each other. Jake is in hospital fighting for his life from an early part of this book so we don’t see much of him – he’s one of Nikki’s only friends, having taken her from the streets years ago and given her something to live for. He and his wife are like surrogate parents and Nikki fears Mary will persuade him to give up if he pulls through, and move far away leaving her jobless and friendless. 😦 Poor Nikki – life is tough for her, and just when it looks up and she meets and gives in and let Michael into her life she loses him…. Anyway, they have to pose as a honeymoon couple to trace people who’ve mysteriously gone missing from a popular resort. You know bad things are in store when they meet a vampire driver for the hotel at the airport and he looks sick, and then melts to nothing in front of them. That’s just doesn’t happen to vampires, and they suspect that what they are dealing with is once again something other than the norm, and they are going in virtually blind fighting one of more unknown foes with powers they can’t imagine. Oh and along the way a very beautiful vampire lover from Michaels history comes along. Poor Nikki, and just what will meeting her after so many years do to Michael. Does he still love her? All questions Nikki asks herself. Well written and edited, priced at £4.98 for 288 pages, its not the cheapest but its definitely one I’d read over and over especially as I love to go through a whole series back to back. This series has just been extensively edited and is being re released July to Oct 2013. Its a great series for lovers of urban fantasy and paranormal romance.